Astronomers have made the most detailed study yet of an extremely massive young galaxy cluster using three space telescopes. 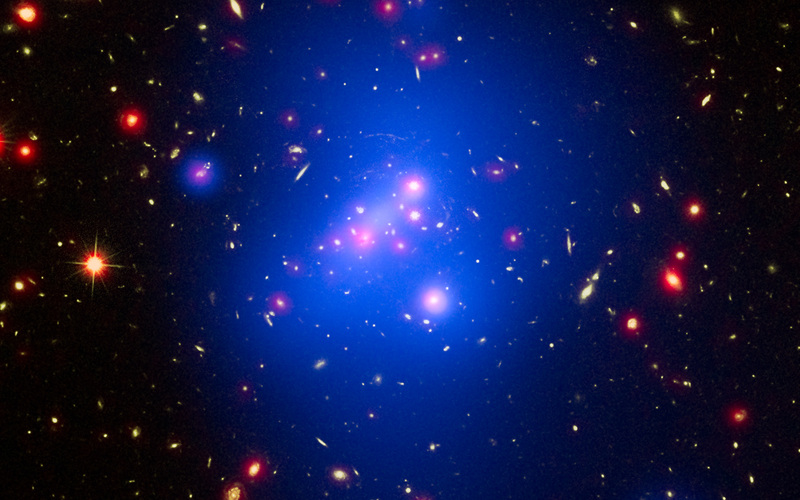 This multi-wavelength image shows this galaxy cluster, called IDCS J1426.5+3508 (IDCS 1426 for short), in X-rays from the NASA Chandra X-ray Observatory in blue, visible light from the NASA/ESA Hubble Space Telescope in green, and infrared light from the NASA Spitzer Space Telescope in red. 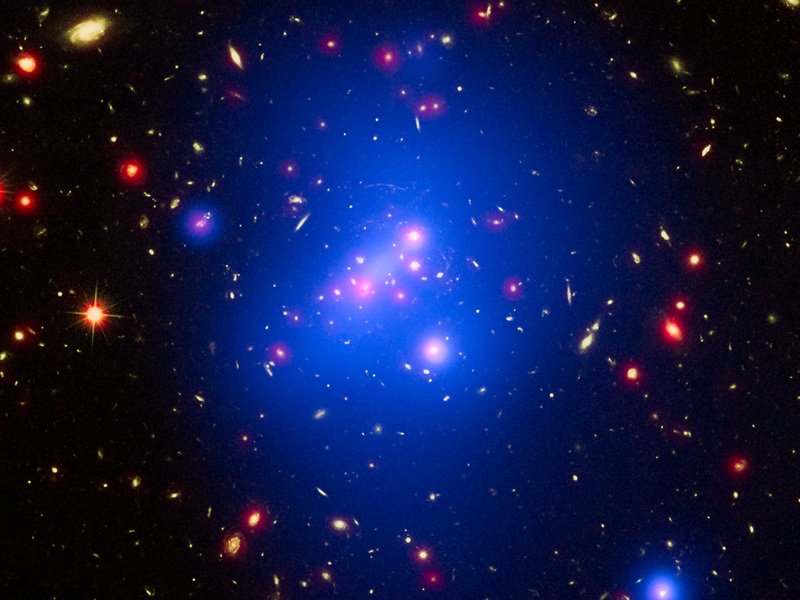 This rare galaxy cluster, which is located 10 billion light-years from Earth, weighs almost 500 trillion suns. This object has important implications for understanding how these megastructures formed and evolved early in the Universe. Astronomers have observed IDCS 1426 when the Universe was less than a third of its current age. It is the most massive galaxy cluster detected at such an early age. First discovered by the Spitzer Space Telescope in 2012, IDCS 1426 was then observed using the Hubble Space Telescope and the Keck Observatory to determine its distance. Observations from the Combined Array for Millimeter Wave Astronomy indicated it was extremely massive. New data from the Chandra X-ray Observatory confirm the galaxy cluster mass and show that about 90 percent of the mass of the cluster is in the form of dark matter, the mysterious substance that has so far been detected only through its gravitational pull on normal matter composed of atoms. 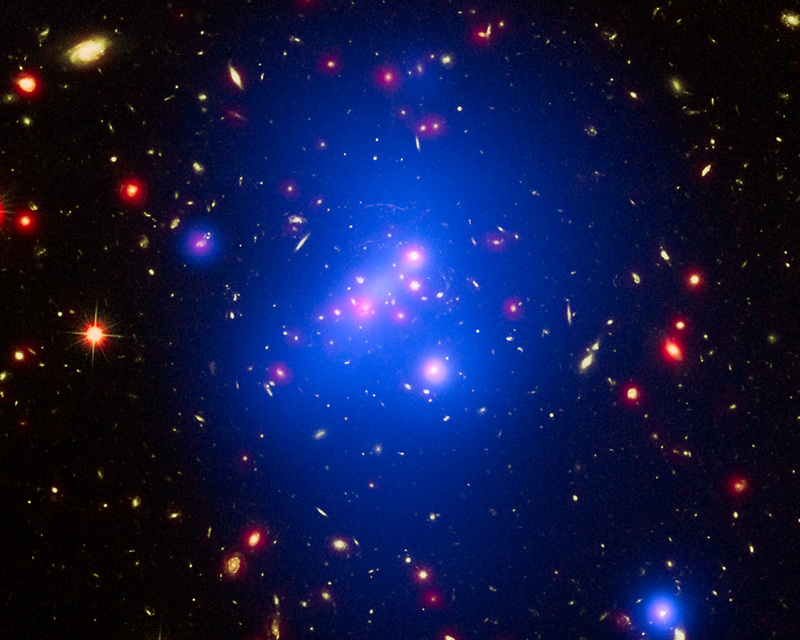 There is a region of bright X-ray emission (seen as blue-white) near the middle of the cluster, but not exactly at the centre. The location of this "core" of gas suggests that the cluster has had a collision or interaction with another massive system of galaxies relatively recently, perhaps within about the last 500 million years. This would cause the core to "slosh" around like wine in a moving glass and become offset as it appears to be in the Chandra data. Such a merger would not be surprising, given that astronomers are observing IDCS 1426 when the universe was only 3.8 billion years old. So that an enormous structure can form so rapidly, scientists think mergers with smaller clusters would likely play a role in a large cluster's growth. This core, while still extremely hot, contains cooler gas than its surroundings. This is the most distant galaxy cluster where such a "cool core" of gas has been observed. Astronomers think these cool cores are important in understanding how quickly hot gas cools off in clusters, influencing the rate of stars at which stars are born. This cooling rate can be slowed down by outbursts from a supermassive black hole in the centre of the cluster. 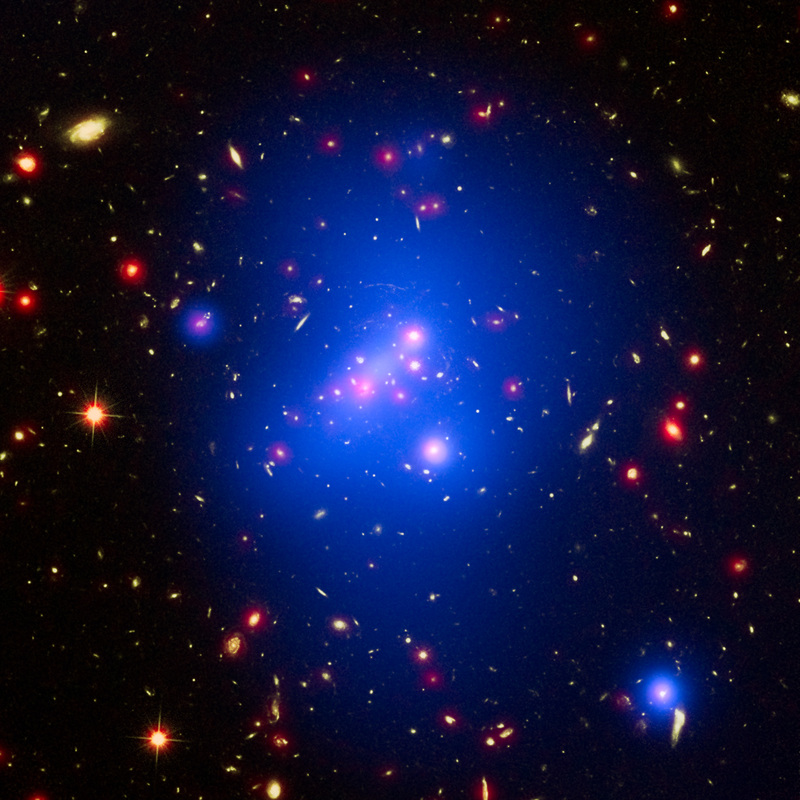 Apart from the cool core, the hot gas in the cluster is remarkably symmetrical and smooth. This is another piece of evidence that IDCS 1426 formed very rapidly and quickly in the early Universe. Despite the high mass and rapid evolution of this cluster, its existence does not pose a threat to the standard model of cosmology. These results were presented at the 227th meeting of the American Astronomical Society meeting in Kissimmee, Florida. Position (Dec): 35° 8' 21.93"